2015-01-26 22:56:25 INFO OGG-01640 BOUNDED RECOVERY: recovery start XID: 0.0.0. 0832, SCN: 2.2247142093 (10837076685), Timestamp: 2015-01-26 19:40:32.000000, Thread: 1. 28, SCN: 2.2247142093 (10837076685), Timestamp: 2015-01-26 19:40:32.000000, Thread: 1. 7376, SCN: 2.2247142094 (10837076686), Timestamp: 2015-01-26 19:40:33.000000, Thread: 2. 72, SCN: 2.2247142094 (10837076686), Timestamp: 2015-01-26 19:40:33.000000, Thread: 2. 2015-01-26 22:56:26 INFO OGG-01579 BOUNDED RECOVERY: VALID BCP: CP.E_TRAVEL.000000008. 2015-01-26 22:56:27 INFO OGG-00546 Default thread stack size: 10485760. BA 135488016, SCN 2.2247629340, 2015-1-26 下午10:55:56. BA 193658896, SCN 2.2247629266, 2015-1-26 下午10:55:53. 2015-01-26 22:56:27 INFO OGG-01478 Output file ./dirdat/l3 is using format RELEASE 11.2. 2015-01-26 22:56:27 INFO OGG-01026 Rolling over remote file ./dirdat/l3000412. 2015-01-26 22:56:28 INFO OGG-01057 Recovery completed for all targets. ad 1: start=SeqNo: 6246, RBA: 197371920, SCN: 2.2248318956 (10838253548), Timestamp: 2015-01-27 02:56:31. 000000, end=SeqNo: 6246, RBA: 197385728, SCN: 2.2248318991 (10838253583), Timestamp: 2015-01-27 02:56:32.
ad 2: start=SeqNo: 6108, RBA: 121694224, SCN: 2.2248318963 (10838253555), Timestamp: 2015-01-27 02:56:31. 000000, end=SeqNo: 6108, RBA: 121740288, SCN: 2.2248319055 (10838253647), Timestamp: 2015-01-27 02:56:33.
ad 1: start=SeqNo: 6246, RBA: 396068880, SCN: 2.2248864527 (10838799119), Timestamp: 2015-01-27 06:56:40. 000000, end=SeqNo: 6246, RBA: 396122624, SCN: 2.2248864770 (10838799362), Timestamp: 2015-01-27 06:56:43.
ad 2: start=SeqNo: 6108, RBA: 275654160, SCN: 2.2248864722 (10838799314), Timestamp: 2015-01-27 06:56:42.
ad 1: start=SeqNo: 6247, RBA: 400148496, SCN: 2.2249669669 (10839604261), Timestamp: 2015-01-27 10:56:46. 000000, end=SeqNo: 6247, RBA: 400321024, SCN: 2.2249669902 (10839604494), Timestamp: 2015-01-27 10:56:48. 2015-01-27 07:56:49 INFO OGG-03035 Operating system character set identified as UTF-8. Locale: zh_CN, LC_ALL:. 2015-01-27 07:56:54 INFO OGG-01226 Socket buffer size set to 27985 (flush size 27985). 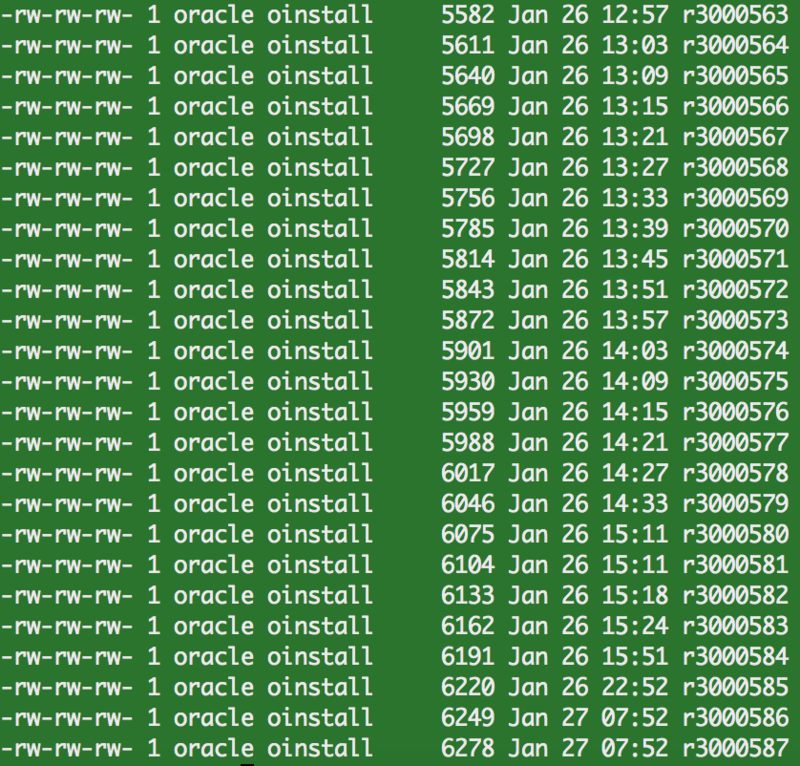 2015-01-27 07:56:54 INFO OGG-01055 Recovery initialization completed for target file ./dirdat/r3000586, at RBA 6249. 2015-01-27 07:56:54 INFO OGG-01478 Output file ./dirdat/r3 is using format RELEASE 11.2. 2015-01-27 07:56:54 INFO OGG-01026 Rolling over remote file ./dirdat/r3000587. 2015-01-27 07:56:54 INFO OGG-01053 Recovery completed for target file ./dirdat/r3000587, at RBA 6215. 2015-01-27 07:56:54 INFO OGG-01057 Recovery completed for all targets. 2015-01-27 08:31:42 INFO OGG-01021 Command received from GGSCI: STOP. GMT+8, 2019-4-19 01:05 , Processed in 0.062418 second(s), 24 queries .